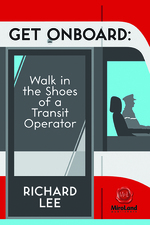 In an article for Open Book Toronto, writer Dalton Higgins discusses Richard Lee’s Get Onboard: Walk in the Shoes of a Transit Operator. Higgins reflects on Toronto’s sometimes problematic transit system, comparing the TTC to similar subway systems in New York and Cophenhagen, but also asserts that Lee’s book has caused Higgins to have a newfound empathy for TTC workers. Higgins begins his article by listing a few common frustrations with the TTC, “between the routine subway closures for what is called ‘signal work’ and ‘scheduled upgrades.’ All the way to trains holding due [to] Toronto Police investigations, fire investigations, medical emergencies, emergency alarms being activated and security incidents on trains, subway and bus service delays have become ubiquitous, kinda like the Kardashians”. In comparison to the “extremely energy efficient” subway system in New York and the “well-oiled machine” of public transportation in Copenhagen, the TTC can seem pretty disorganized. Yet after reading Lee’s Get Onboard: Walk in the Shoes of a Transit Operator, Higgins has come to understand the struggle of a TTC worker. This book, which “spells out some of the behind-the-scenes realities of being a frontline transit employee”, illuminates the difficulties for a TTC worker that can make the job “both traumatizing and liberating”. Lee’s collection of testimonials reveals not only the abuse faced by TTC workers, but also the mental labor of “fielding customer queries by the dozens daily” and the “non-traditional shifts, which can ultimately mean missing family events, weddings and special occasions”. Lee’s book is also a reflection on his own personal struggles, “the author’s journey of overcoming a stutter problem as a child, having an absentee dad, to surviving dead end McDonald’s jobs and failed basketball scholarship opportunities…But Lee operates much like Horatio Alger – but from the GTA and with a TTC uniform on – and he lands a job at the TTC, eventually becoming a supervisor”. In spite of the ways that the TTC can sometimes be inconvenient, Higgins explains that Lee’s book has changed his understanding of the TTC, stating “empathy is the word I would use to describe how I now interpret the plight of the TTC operator”. Get Onboard has dispelled many of Higgins’ prior misconceptions of TTC workers, such as “the omnipresent caricature of staffers sitting all day and doing little but being rude while watching people drop tokens in these little metal boxes”. This perspective “just doesn’t hold up after reading the book”. Get Onboard is Richard Lee’s first novel, which was written when Lee began to trust his natural gift for storytelling. Besides this accomplishment, Lee has been driven by a fear of only ever being an “average man”, which has helped him to become a supervisor today with the Toronto Transit Commission. Tagged with Dalton Higgins, Get Onboard: Walk in the Shoes of a Transit Operator, Richard Lee, TTC.